Check out our YouTube Channel to watch additional My Brother Vinny videos and learn more. Grace Notes: My Brother Vinny, Yorktown Heights Engine Co #1. Interview with Yorktown Town Supervisor Michael Grace and Bruce Apar of Chase Media Group Harrison Apar Foundation. My Brother Vinny "Day in the Life"
Amazing Day!! My Brother Vinny was recognized as the State Farm "Good Neighbor of the Month" at Yankee Stadium. One of our supporters Lisa Carlucci nominated us. 2018 - My Brother Vinny voted Most Loved Business for 2018! 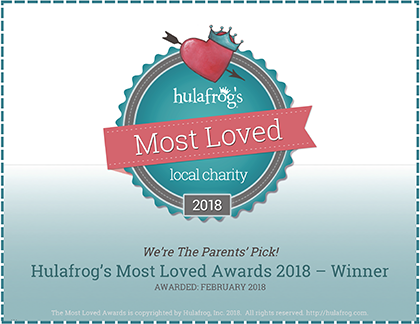 Hulafrog, a local site that features kid-friendly businesses and events, honored MVB with teh title "Most Loved Charity." Their readers voted for their fave businesses in each category over the month of January. Winners were announced in a newsletter and a Facebook post! ALBANY, NY – Thanks to “My Brother Vinny” and its founder, Paula Miritello, there over 450 veterans in the Hudson Valley who sleep more comfortably at night. Amazing Day! It was truly such a wonderful day! 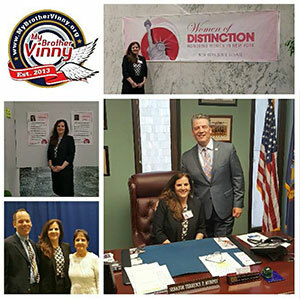 We arrived at our NY State Capitol in Albany a few hours before the "Women of Distinction" ceremony to go to the "New York States Chamber" where we observed the Senates reading of the Women of Distinction Resoluton, followed by a tour. We also got to see the photo framed with each honorees accomplishments on display located in the Well of the Legislative Office Building. It was a beautiful honor, to be chosen amongst these amazing ladies as a "Women of Distinction". We each represented a Senate District in NY, bringing together a diverse group of empowering women. So many generations of ladies bringing passion and purpose with the desire to make the world a better place. No cause was greater, our shared desire to bring change and a betterment to society was evident. It was such a beautiful part of the ceremony hearing the readings, I listened so intently to each story. The world is truly a beautiful place, despite the struggles so many of these women encountered they embraced their heartaches and shared their message to bring beauty and change. Thank you so very much NY Senator Terrence P. Murphy of the 40th Senate District for the honor of being chosen as your 2017 "Women of Distinction". Thank you for taking the time to learn about our work with My Brother Vinny, finding our message and desire to help our Veterans worthy of this honor. Special Thanks to Senator Murphys staff for coordinating today's efforts and supporting our work through this honor. Thank you so much to my Mother & boyfriend Kenny Beck for sharing this day with me. With Mother's Day this Sunday it made me extra thankful she was here you share this moment. Thank you Blaise Gomez for the beautiful piece on MBV. It was truly heartwarming and we are grateful that you took the time for us. Please help MBV continue assisting our Vets by making a finanical donation today. 2015 Honoree, Caring for the Homeless of Peekskill "CHOP" Jan Peek Shelter. We provide on Christmas morning holiday gifts to over 25 citizens on the streets of NYC. The gifts contain the following – Dunkin Donut Gift Cards, Gloves, Coats, Hand warmers, Hats, Candy, Lotion, Mylar blankets, Sanitizers and a variety of other essential items. An annual party that is held the final day of the food drive at the Elks Club in Yorktown. The day of the party donors can bring in items to donate which are sorted on the spot. The party is given as a way to say thank you to the sponsors and raise additional funds to donation holiday gift giving gifts to the residents of Mohegan park and homeless citizens during the holiday season. The party features vendors, arts, crafts, face painting, cupcake decorating, games and fun for all the family! From June to October we sponsor a monthly ice cream donation day for the residents of Mohegan Park Home for Adults in Mohegan Lake, NY. Mohegan Park is a private run home for the mentally and emotionally disabled. With generous donations we are able to send a special treat of an Ice Cream truck for all the residents to pick whatever they would like. The Miles for Medals Walk is an annual walk to benefit the Special Olympics of NY Hudson Valley Region. Handle all aspects of fundraising, outreach, event raffles, team management, public relations, etc. My Brother Vinny assists in raising over $ 25,000 annually through fundraisers which strives to keeps Special Olympics admin costs at a minimum. Available also are fully funded t-shirt that we pay for through donations, food, and team promos. The Special Olympics Miles for Medals walk provides funding for over 3500 Athletes in the Hudson Valley Region that compete free of charge in all Special Olympics Events. My Brother Vinny Mohegan Park & Yorktown Head Start Valentine PJ Day! Event Gifts given to all 144 Mohegan Park Adult Home Residents and coordination of donation of PJ’s from Pajama Program for all 50 children enrolled in program for low income families. (Mohegan Lake, NY & Yorktown Event.